WordPress is a powerful platform, and it drives millions of websites each and every day. WordPress isn’t just a “set it and forget it” type of platform, though. It is important to check up on your WordPress sites to ensure that they’re performing to their top abilities. The good news is that WordPress makes website maintenance very easy, and it takes only a few minutes to perform these tasks. 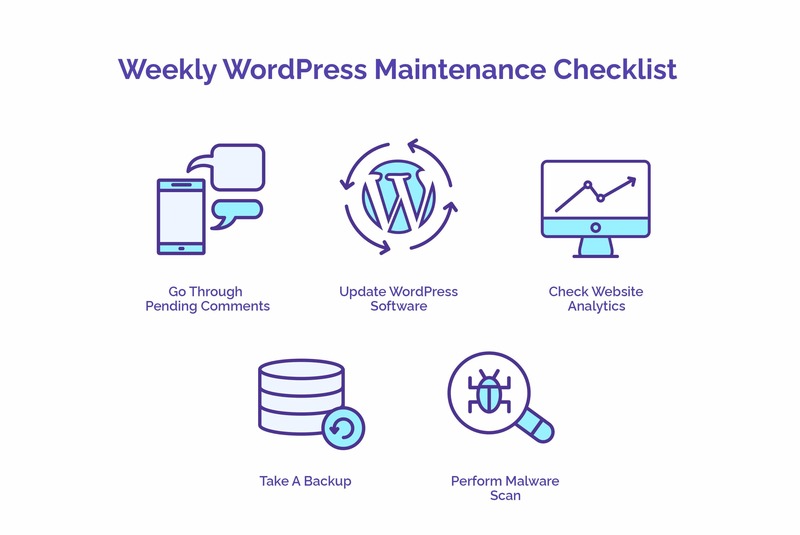 Below we’ve provided a weekly maintenance checklist to help you keep on top of your WordPress tasks. Your readers likely have something to say to you! If you don’t check your comments regularly, you’re missing out on valuable interaction with your readers. You can check your blog comments by going to your WordPress Admin area and clicking “Comments”. From there, you can approve comments and mark others as spam. WordPress needs to be updated regularly to stay secure. WordPress software includes themes, plugins, and the core software itself. It is a good idea to check for updates weekly. WordPress makes updating very easy by allowing you to apply updates with the click of a button, and in some cases, WordPress is even able to update automatically. Analytics software is the best way to know how your website is performing and faring. If there has been a sudden drop or surge in traffic, it is important to know where the traffic is coming from. This can allow you to write better content that focuses more on the market that you’re serving. Taking a website backup is always a good idea. There are some tools within WordPress to take backups automatically, but most web hosts offer the option of a cPanel backup, which automatically bundles everything from emails to databases to website files. These backups can easily be restored by web hosts, and they can be transferred in case you ever move your website. Website owners are often surprised by malware that can be found on their websites. Unfortunately, out-of-date websites are often targeted for malware. Infectious malware can destroy search engine rankings and make it difficult for customers to trust your website. Luckily, some web hosts perform nightly security scans, and it is easy to perform a scan within cPanel.